Summary: The public political and cultural life of American Christianity has drastically morphed from the early 20th century to now. Douthat argues that Christians should not feel so embattled against secularism - just against aggressive secularism (which grows as Christians become more extreme). Rather, internal fracturing is the greatest threat to Christianity in our times... Douthat labels many of these streams as heretical, hence the title. His thesis is that we are not living in a Christian or post-Christian age, but that we are living in an age of heresy, where cultural forces want to reshape Jesus in the image of our own preoccupations. 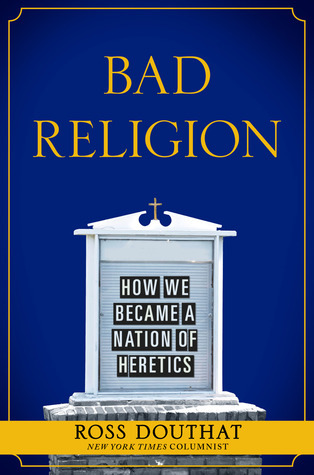 Thoughts: As far as genre goes, I think would classify Bad Religion as prophetic history. He paints the recent past with the brush of the current cultural situation, allowing us to draw comparisons and differences from those "golden eras" of American religious life. Douthat asserts that while religious institutions have declined, religious belief has actually grown (he points out that more people believed in an afterlife in the 1990's than in the 1940's). His history of American religious life is illuminating precisely because it is not strictly objective (then again, what history is? )- he allows the reader to extrapolate lessons from his version of the past that apply to our current context. Douthat highlights several themes throughout his historical accounts. First and foremost, he illustrates how the political polarization of the Church came to be. He views this as a negative development, as it causes the faith to be firmly identified with a political platform that may or may not align with Christian belief. It also creates an ethos of "all or nothing" within the church, with conservative churches convinced that the Republican ticket is the ONLY Christian choice, and liberal churches convinced that the Democratic candidate is the ONLY moral choice. Spirituality and politics become conflated and lead to the savior/apocalypse cycle that we see on both sides. "If Obama/Romney loses, the world is over. If Obama/Romney wins, we are saved." When I saw Douthat talk, my favorite quote of the night from him was about the damage that this conflation does to Christian witness: "People look at the church's politics and think, if you don't like Republicans, you probably don't like Christians." Douthat also shows how the sexual revolution and economic prosperity have changed the religious landscape. Christian sexual ethics used to be socially acceptable because, pre-birth control, they were accepted common sense. It wasn't that America was more Christian - it was that the spiritual principles of chastity intersected with the pragmatic principles of family planning. He's saying that sexual ethics have never been popular, but they used to seem more practical to nominal Christians or non-Christians. Likewise, he argues that the Christian ethics of economic simplicity or asceticism were never popular, but before the economic boom years, they weren't as problematic. He discusses several "heresies," which in his definition seems to be the incorrect attempts to make Jesus /God culturally relevant (see Joel Osteen, Elizabeth Gilbert, Dan Brown, etc.). What fascinated me was his diagnosis of these phenomenon as religious energies being diverted from formal religion as those structures weaken. Our religious impulses aren't gone - they have been funneled into our politics, our social causes, or our media. 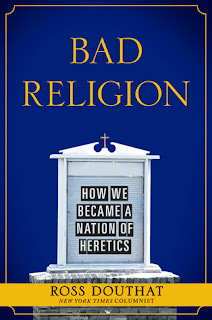 Though Douthat is a self-identified conservative, his relentless moderation between the religionists who say secularism is the root of all our problems and the secularists who say religion is the root of all our problems compelled me most in the book. He is saying that everyone is wrong - that's my kind of argument! His critique of some religionists' theocratic rhetoric would hopefully inspire that camp to ask themselves... what do we really want? Do we really want a state like Saudi Arabia where religion is "enforced"? Douthat is calling them on the carpet to really think through what their idealism would look like practically. Likewise, his critique of the secularists would hopefully inspire them to ask themselves... what are our notions of freedom and equality predicated on? What is supporting our ideology when we've hollowed out all the religious underpinnings? Douthat is calling them on the carpet to confront the fact that they are wanting to have their cake and eat it, too. I find this book very hopeful, especially after hearing Douthat speak. Basically, he sees that Christians dominating politics is not the primary way that we should declare Jesus' lordship. He's advocating for sanctity in the church ("letting the church be the church") - the outpouring of sanctification should be culturally and politically manifested, but we shouldn't confuse the method with the result. I was especially inclined to agree with him on the dire need for good art being made by Christians - not Amish romances or low budget didactic movies, but the great art in the tradition of our fore-bearers that appeals to the society as a whole. This has been a really nasty election cycle. Both sides have been unnecessarily harsh and uncharitable to each other. For Christians who are trying to reorient themselves in the new landscape, I would challenge you to read this book prayerfully and to look at where our cultural affiliations have significantly tarnished the message of our True King. For non-Christians who are baffled by why Christians are so (fill in the negative adjective here), I would challenge you to read this book with an open mind and to try to understand why cultural Christianity has taken the shape that it has. Bad Religion has been immensely helpful for me in articulating my thoughts on politics and culture. I don't always agree with Douthat's conclusions (he's a conservative who has made me more liberal - oh, sweet irony). I, however, am very grateful for how clearly (and relatively fairly) he lays out the terms and stakes of the current situation. Do you ever feel frustrated with the cultural manifestations of your religious beliefs (or lack thereof)?